I was the leader and manager of the Australian Cotton Club Orchestra for 20 years from 1986 to 2006. (The band is still going, under different management). The Orchestra was a 12-piece big band (including a singer) playing jazz, swing and popular songs from the 1930s and 40s. During this time we played hundreds of gigs, mainly at high society functions in 5-star international hotels in the Melbourne CBD. 99% of the time we were well paid and treated, usually eating the same food as served to the guests in our own large dressing room etc. But there were a few gigs where we were not as well treated, and I think it may be cathartic to get them off my chest in this memoir. One of the worst ones was for an AFL football club, where a couple of drunken players tried to sing with the band. One of them got up on stage, pushed our singer aside and insisted that we play some current pop song that we had never heard of. He wouldn’t take no for an answer, and not a single club official tried to stop him. (I gather that these players are treated like gods and nobody ever says no to them, including women). We started playing one of our usual songs that the football player had never heard of, so he eventually staggered off stage and back to his table. To add injury to insult, the club wouldn’t pay us for about 3 months, and then only because we threatened legal action. After that particular gig from hell, we resolved never to play for a football club again. We were always previously engaged whenever a footy club rang us. Another gig from hell was when we shared the bill with a cowboy on a horse. Yes, that’s right, he brought his horse inside the hotel and up the stairs to the ballroom where we were playing. He and his horse galloped towards us and leaped onto the temporary stage. Some of our quicker-witted musicians fled for their lives, whilst the rest of us stayed riveted to our seats in shock, with the horse prancing and rearing on the stage making us almost seasick with the rocking motion. I thought the stage was about to collapse! The cowboy then reached into his saddle bags and handed out the musical parts for some country song that we had never heard of before, let alone seen the music for, or rehearsed. But being professional musicians (except for me) the band played it OK and the cowboy sang along with us, still seated on his horse. Then without a word of thanks or acknowledgement, the cowboy and his horse leaped off the stage and galloped around the guest tables at high speed. I was horrified that if even one drunken guest had got up from his table at the wrong time, he or she could have been trampled to death by this horse. One gig not quite so bad was at a leading 5-star hotel where they tried to serve us stale sandwiches for dinner that had obviously been left over from lunch time. We sent them back to the kitchen saying they were unacceptable. The hotel refused to serve us a proper meal (which was in our contract with the booking agent) so we rang and ordered pizzas to be delivered from outside the hotel. Hopefully, the hotel management were embarrassed at the sight of pizza deliverers marching through the reception area and ballroom of the hotel. Needless to say, we refused to work at that hotel (or for the agent who booked us) again. At other posh society functions we were occasionally approached by tipsy female opera singers who wanted to sing with the band. For the sake of both their reputations and ours, I tactfully tried to explain that our musical arrangements were in the wrong keys for their soprano voices, which was probably at least half true. Earlier in our career, we played in various pubs in the suburbs of South Melbourne, Richmond and Hawthorn. Here we were paid less and received no meals or drinks, but we were playing up to 3 or 4 nights per week gradually improving our repertoire and becoming better known around town. Whilst we didn’t do ‘door deals’, staff collecting entry fees told me that plain-clothes policemen and women used to ‘flash their freddies’ and get in free. Publicans and bandleaders like me were happy to have police present in case there was any trouble. Although we would also get the occasional ‘dontcha know who I am?’ VIP who could easily afford the modest entry fee and was less welcome. We often played with a female vocal trio named Rhapsody in Red, and their pianist also became our pianist. We recorded a CD album with them, although it was not our best one, in my view. Everything seemed to be going well until the girls suddenly demanded a much higher fee which priced themselves out of the market, and that was the end of that. We didn’t have much trouble playing in pubs; although I do remember one muso who got out his trumpet and started playing along with us uninvited. If he had asked us, we might have let him take an ad lib solo or two (he said he couldn’t read music). One or two audience members asked me “Can’t youse play any rock ‘n roll?”. My usual answer was “Do you go to a French restaurant and order Chinese?”. Another guy insisted that we play a tune that was not in our repertoire (unlike small groups, it is not possible for big bands to ‘fake’ a tune – the music needs to be pre-arranged). This guy would simply not take no for an answer, and he used to follow us around the pubs harassing me between sets (the pubs had no dressing rooms). Fortunately, some burly band members and sometimes audience members (but not the plain clothes police) realised what was happening, and used to stand between me and this guy for my protection. If it wasn’t for their help, I would have seriously thought about hiring a bodyguard because I suspected that my harasser ‘had a kangaroo loose in the top paddock’ as we say in Australia. (Police tell me that threats of violence should always be taken seriously). We had the occasional gigs in pubs where the staff played Muzak over their PA whilst we were playing. I remember one where the publican turned the lights off (we are a reading big band). So we had to stop playing mid-tune until they turned the lights back on again. I don’t think that these minor incidents were malicious – just lack of attention to detail. Jazz musical lineages are normally tracked by instrument. Leading musicians are often described in the literature as having been primarily influenced by their predecessors on the same instrument – trumpeters are influenced by trumpeters, saxophonists by saxophonists, and so on. In this essay, I propose to put forward a thesis that in the 1920s, trumpeter Louis Armstrong was the major jazz influence on tenor saxophonist Coleman Hawkins as a soloist; and that Hawkins also influenced musicians on other instruments, such as Roy Eldridge on trumpet. This influence of Armstrong on Hawkins was mediated by bandleader Fletcher Henderson, in whose orchestra both were members from October 1924 to November 1925. Louis Armstrong is widely regarded as the first great jazz soloist;  although Sidney Bechet was arguably the first notable jazz soloist to make a recording. Armstrong was born in 1901 in the poorest section of New Orleans. He learned to play the cornet in the Coloured Waif’s Home where he later became leader of the children’s band there. After he left the Waif’s Home, by day he was delivering coal from a mule-drawn cart and later on by night he was playing cornet in honky-tonk bars. In time, he graduated to become a full-time musician, playing in the bands of Kid Ory, Fate Marable and the Tuxedo Brass Band. Armstrong’s main cornet mentor during his early life had been Joe ‘King’ Oliver, who had left New Orleans for Chicago in 1918 after the closing down of the Storyville red light district. In mid-1922, Oliver invited Armstrong to play second cornet in his Creole Jazz Band at the Lincoln Gardens dance hall on the south side of Chicago. It has never been clear why Oliver made this invitation, as these early jazz bands did not usually include two cornets. The early New Orleans style of jazz was polyphonic, based on collective improvisation rather than solos with accompaniment. According to Gioia, ‘no early jazz band was better at this ensemble style of playing than Oliver’s Creole Jazz Band’. The only real exceptions to this ensemble New Orleans style were in the breaks, such as the two-cornet breaks in the Oliver band where Armstrong harmonised with Oliver’s lead. In the 1923 recordings of Oliver’s Creole Jazz Band we can hear the young Louis Armstrong ‘groping towards a solo-based jazz style: he is beginning to express feelings which will not long be containable within the matrix of the New Orleans model from which he sprang’. According to musicologist Gunther Schuller, Armstrong was ‘skillfully treading the fine line between the functional requirements of second cornet to King Oliver and his own burgeoning solo tendencies’. On the 26 October 1923 recording of ‘Mabel’s Dream’, Armstrong plays an innovative and very appealing open horn counter-melody against Oliver’s muted statement of the original melody, which whether intentional or not sounds louder than Oliver’s playing. Schuller describes this counter-melody as an amazing performance in its simplicity. A transcription by Schuller of the first eight bars of both recorded parts is as follows. Figure 1. – first eight bars of Louis Armstrong’s counter-melody in ‘Mabel’s Dream’, as recorded by King Oliver’s Creole Jazz Band on 26 October 1923. The writer and musicologist Edward Brooks classifies Armstrong’s counter-melody as a solo that ‘constitutes one of the most moving climaxes of early jazz’. According to the biographer Laurence Bergreen, Armstrong then experienced some racial discrimination when he tried to join the band of Sammy Stewart, who was a light-skinned African-American who had only Creoles and light-skinned blacks in his band. Bergreen’s view is that Armstrong was too dark-skinned for Stewart’s band. Fortunately, Armstrong managed to get a job as first trumpet with Ollie Powers’ band in Chicago. However, as there are no relevant recordings, it is not clear how many solo opportunities Armstrong had in Powers’ band. 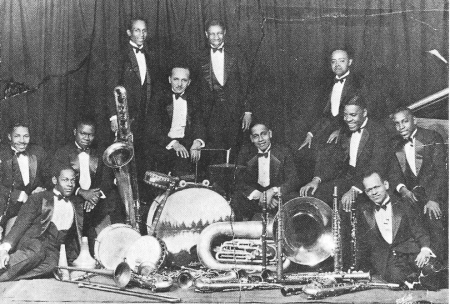 In September 1924, the successful African-American dance band leader Fletcher Henderson hired Armstrong specifically to be his featured soloist in New York. Henderson had previously heard Armstrong in 1922 whilst on tour in New Orleans and offered him a job in his small touring band, but Armstrong had turned the offer down. As Henderson’s 1924 offer now provided Armstrong an ideal opportunity to develop his own musical identity, he readily accepted it and travelled by train to New York from Chicago. Gioia described this transition as a major watershed in jazz history: ‘The New Orleans pioneers exit stage left; Armstrong on trumpet enters stage right heralding the new Age of the Soloist’. Similarly, Giddens credits Armstrong with changing jazz from a collective idiom to a soloists art. Before going on to discuss Armstrong’s performances with Henderson’s band, it is appropriate to outline the social and musical context that Armstrong was heading into. Not only was there racial segregation between White and Black musicians, audiences and record buyers; there was also a structured hierarchy amongst the Black jazz musicians. Trumpeter Rex Stewart has outlined what in effect was a four-tiered caste system amongst Black musicians in the New York of the mid-1920s. At the top was the Clef Club, a union of Black musicians founded by former US Army Lieutenant James Reese Europe who played at ‘society’ functions, including for Whites-only audiences. Next were the touring vaudeville musicians such as Mamie Smith and her band who played for both Black and White audiences. Then there were the larger dance bands led by Fletcher Henderson, Sam Wooding and Billy Fowler who played in public for Black-only audiences. On the lowest rung were musicians playing in small clubs, penny-a-dance halls and presumably speakeasies, again only for Black audiences. Black musicians in the higher levels had little to do with those on the lowest level. Jazz historians agree that Henderson was a major figure, initially as a bandleader and musical talent spotter, and later as an arranger and composer. But before Armstrong joined it, Henderson’s band was primarily an expert reading band playing written dance band arrangements inspired by the leading White bands such as those of Paul Whiteman and Vincent Lopez. 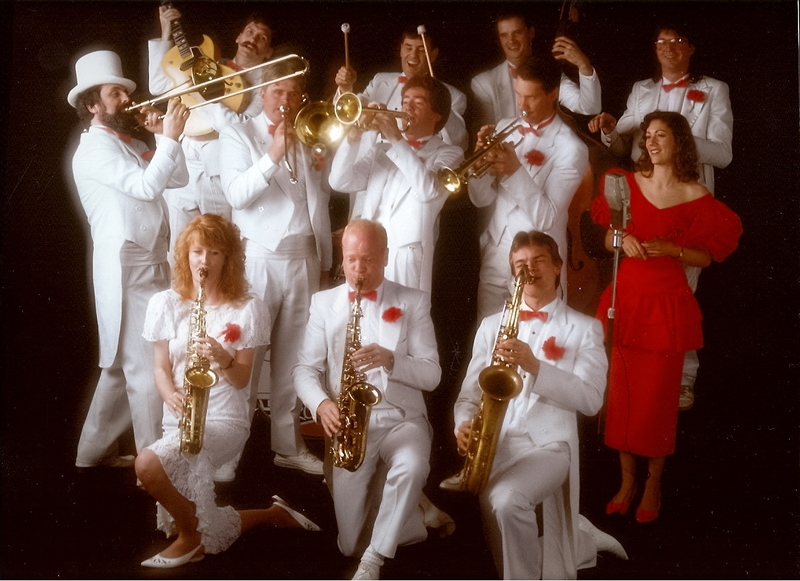 On the basis of their early recordings, the Henderson Orchestra even sounded like these White dance bands, and for this reason are likely to have sold records to White consumers. Yet Henderson also made ‘race records’ backing blues singers, thus appealing to Black record-buying consumers as well. In this way, Henderson had cleverly segmented both the Black and White markets for his recordings. Henderson himself and his musicians, such as Charlie Dixon, Kaiser Marshall and Coleman Hawkins enjoyed Clef Club membership and contacts. So some members of Henderson’s band may have looked down upon Louis Armstrong socially if not musically. On the other hand, musicians soon came to admire Armstrong’s unrivalled abilities as a jazz soloist. Schuller is amazed at the disparity in quality between Armstrong’s solos and those of other musicians in the Henderson band’s early recordings. For instance, Armstrong’s hot solo on ‘Mandy Make Up Your Mind’ immediately follows some corny ‘doo-wacka-doo’ four-bar passages by the other two trumpeters Howard Scott and Elmer Chambers. These passages were interspersed with some old-fashioned straight tenor sax playing by Coleman Hawkins, complete with the dated staccato slap-tonguing that very soon would go completely out of style. Louis Armstrong himself described the impact he made on Henderson’s band as follows. Well, I knew I couldn’t read music as fast as them cats, and Fletcher never let me sing. They’d got me there to blow that hot stuff. Lot of the time all I had to play in the arrangement was a 8 bar, maybe 16 bar solo. First time I did it, they went wild and I did too. Them cats all stood up and applauded and cheered. Just another night to me, you know, but it’s a good feeling to know that they satisfied that you’re with them’. The British trumpeter Humphrey Lyttelton reports Henderson’s principal arranger and lead alto player Don Redman as saying that ‘Louis, his style and his feeling, changed our whole idea about the band musically’. Every bandleader then wanted to hire a trumpet soloist in Armstrong’s mould, from Paul Whiteman to Duke Ellington. Like Henderson, Coleman Hawkins came from a middle-class African-American family. His tours with Mamie Smith’s Jazz Hounds in 1922-23 placed him high in Rex Stewart’s second tier of black musicians. One of the few other jazz tenor saxophonists of this period, Prince Robinson had toured with Lillian Jones Jazz Hounds in 1919-21. In this way, the tenor saxophone came to jazz via vaudeville. Hawkins joined Fletcher Henderson’s Orchestra in 1923, where he remained until 1934, sometimes doubling on clarinet and in the early years, on bass saxophone. Prior to Louis Armstrong joining Henderson, Hawkins’ solos, whilst musically competent, lacked ‘swing’ or a jazz feel to them. They were typical of the early dance band style of this period. According to the musicologist Jeffrey Magee, Armstrong’s influence left a profound mark on Hawkins. He was stunned by the strength of Armstrong’s music and strove to adapt this style to the tenor saxophone. This influence is illustrated by Hawkins solo on Henderson’s ‘The Stampede’ recorded on 14 May 1926, and notated below. In this solo, ‘Hawkins now deploys a legato fluency in place of the heavy, slap-tongued staccato articulation’ of his earlier style. Figure 2. 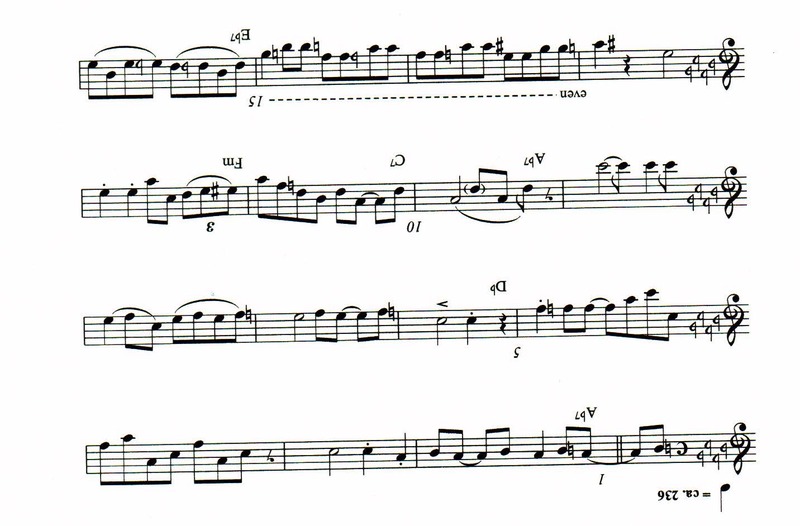 – first fifteen bars of Coleman Hawkin’s solo in ‘The Stampede’, as recorded by Fletcher Henderson and His Orchestra on 14 May 1926. 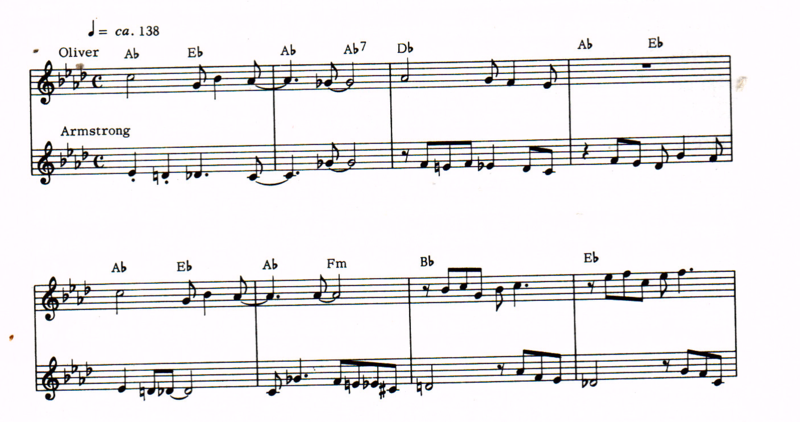 In the first four bars, for example, Hawkins takes a cue from Armstrong’s openings, with a syncopated phrase leading to the familiar three-note figure (mm. 1-2)….Other Armstrong-like effects spring up confidently, like the syncopated double-leap in m.10, and the rising, chromatic downbeat triplet in m.11…..In The Stampede’ we can hear Hawkins telling a story, working on the musical “coherence” that made Armstrong’s solos unique. At the age of 21, fuelled by his encounter with Armstrong, Coleman Hawkins had made impressive strides towards achieving an original solo voice. This essay has illustrated how the young Louis Armstrong emerged from the New Orleans ensemble tradition to become jazz’s first great soloist. By the medium of the Fletcher Henderson Orchestra, and with the encouragement of Fletcher Henderson himself, Armstrong in turn became a major influence on other early jazz soloists such a Coleman Hawkins and Roy Eldridge. In doing so, Armstrong established the general stylistic direction of jazz for several decades to come. Schuller, Gunther. Early Jazz- Its Roots and Musical Development. New York: Oxford University Press. 1968, 89-90. Lyttelton, Humphrey. The Best of Jazz. London: Portico, 1999, 116-122. Giddins, Gary. Visions of Jazz. Oxford: Oxford University Press, 1998, 88. Collier, James Lincoln. Louis Armstrong. London: Pan Books, 1984, 42. Gioia, Ted. The History of Jazz. Oxford: Oxford University Press, 2011. Brooks, Edward. Liner Notes for King Oliver Volume One 1923 to 1929. Festival Records, CD recording, D 26123, Sydney, 1995. Giddins, Visions of Jazz, 81. Panassie, Hugues. Louis Armstrong. New York: Charles Scribner’s Sons, 1971, 10. Schuller, Early Jazz, 78, 90. Bergreen, Laurence. Louis Armstrong – An Extravagant Life. London: HarperCollins, 1997, 233. Giddins, Visions of Jazz, 91. Gioia, Ted. The History of Jazz, 53. Giddins, Visions of Jazz, 88. Magee, Jeffrey. The Uncrowned King of Swing – Fletcher Henderson and Big Band Jazz. Oxford: Oxford University Press, 2005, 30. Magee, Jeffrey. ‘Fletcher Henderson, Composer: A Counter-Entry to the International Dictionary of Black Composers’ Black Music Research Journal, Vol. 19, No. 1, Spring 1999, 2. DeVeaux, Scott and Giddins, Gary. Jazz. New York: W.W. Norton & Company, 2009, 123. Magee, The Uncrowned King of Swing, 34. Meryman, Richard. Louis Armstrong – a self-portrait. New York: The Eakins Press, 1966, 32. Lyttelton, Humphrey. The Best of Jazz. London: Portico, 1999, 109. Giddins, Visions of Jazz, 92. DeVeaux and Giddens. Jazz, 150. Lyttelton, The Best of Jazz, 108. Magee, The Uncrowned King of Swing, 31. Schuller, Gunther. The Swing Era – The Development of Jazz 1930-1945. New York: Oxford University Press. 1989, 427. Magee, The Uncrowned King of Swing, 112. DeVeaux and Giddens. Jazz, 163. Lyttelton, The Best of Jazz, 113. Magee, The Uncrowned King of Swing, 114. Lyttelton, The Best of Jazz, 410. Schuller, The Swing Era, 426. Gioia, Ted. The Imperfect Art. Stanford: The Stanford Alumni Association, 1988, 142. It is generally accepted that the primary characteristics that distinguish jazz from other forms of music are syncopation, improvisation and swing. Most of us know what syncopation and improvisation are, but swing is harder to define. For me, it means an entrancing inner momentum or self-propulsion, like a powerboat lifting itself out of the troughs between the waves and planing along on top. 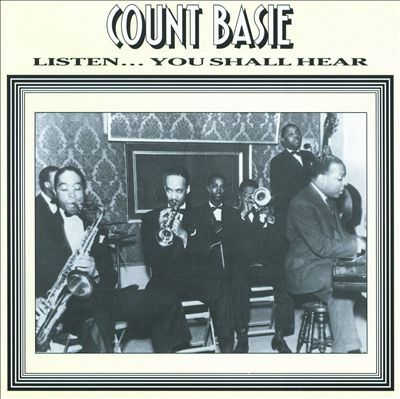 Swing is Count Basie’s main legacy to jazz. As an arranger, it was largely he who lifted the wallowing Bennie Moten band out of the troughs onto a higher rhythmic plane. As a bandleader, he added key soloists from Walter Page’s Blue Devils, creating a new style of big band. As an instrumentalist, he demonstrated the value of short silences or gaps in improvisation. I have been told that the venerated Australian jazz musician Ade Monsborough once said ‘the notes you leave out are as important as the ones you put in.’ (This point appears to be lost on some modern-style improvisers, with their endless runs of quavers and triplets). My first live contact (confrontation?) with Basie’s music was in about 1968, when Jeremy Kellock (later Jerry Noone of ‘Daddy Cool‘ fame) asked me to join a short-lived Basie-type band playing some of his tunes from the late 1930s. Although we found the ensemble riffs relatively easy, we found the rhythmic side very difficult. We just could not get that band to swing anything like Basie’s, and soon gave it away. Later on, I was fortunate enough to hear the Basie band in person at the Dallas Brooks Hall in East Melbourne, and I realise how wise we were to give up trying to play like them. Basie’s characteristics of swing and improvisation are exemplified on this CD album (hep1025), produced by John R.T.Davies for the hep label. The album reissues tracks from the first recording sessions by the full Basie band in 1937. The band had been ‘discovered’ in 1936 by wealthy New York jazz writer and entrepreneur John Hammond. Late one night on his car radio in Chicago, Hammond by chance picked up a broadcast by the Basie band from the Reno Club in Kansas City. Hammond was astute enough to realise he had stumbled on a unique new style of jazz, and how right he was! The new Basie style is evident from the very first track, Honeysuckle Rose, based on the Fletcher Henderson arrangement. (Henderson was kind enough to give the fledgling Basie some of his arrangements to help them through their first gigs). Former Blue Devil vocalist, Jimmie Rushing, features on six of the sixteen tracks, including the melodic title track, Listen…my Children and You Shall Hear and Good Morning Blues, which later became the title of Count Basie’s autobiography. Another feature of this album is the marvellous ‘duelling tenors’ in the contrasting styles of Herschel Evans and Lester Young, particularly on One O’Clock Jump, Time Out, and John’s Idea (named after John Hammond). Buck Clayton’s trumpet shines on Swinging at the Daisy Chain, (named after a popular Harlem bordello), and Topsy, a wonderfully hot composition and arrangement by Basie trombonist Eddie Durham. Topsy also features a good baritone solo by Jack Washington, as does Exactly Like You. The stars of the album, however, are the legendary Basie rhythm section of Jo Jones, Walter Page, Freddie Green and the Count himself. These are the guys who mainly generate the swinging momentum or propulsion, to which I referred earlier, and which no band has been able to emulate since. The album sleeve has an interesting photo of the 1937 band on the front cover, together with comprehensive sleeve notes by Frank Driggs. I would recommend it as an important addition to any broad-minded jazz record collection. 2-CD Album: ‘Hot Syncopated Rarities of the 1920s & 30s’ (VJAZZ 029). Australian Jazz Museum, Wantirna. Since its establishment in June 1996, the Australian Jazz Museum (incorporating the Victorian Jazz Archive) has amassed a huge collection of jazz recordings and memorabilia. The main aim is to collect and store jazz music performed and/or composed by Australian musicians; but the AJM also houses recordings of jazz produced outside Australia, to be used as a reference source. The bulk of the overseas recordings have been generously bequeathed to the AJM as part of deceased estates. In recent years, the AJM has issued some 31 CD albums of recordings from this collection on its own VJAZZ label. ‘Hot Syncopated Rarities of the 1920s & 30s’ (VJAZZ 029) is the AJM’s first album of overseas recordings and hopefully not the last. It is an excellent selection of 48 tracks (24 on each CD), recorded between March 1926 and March 1940. The cover notes say that this period was chosen firstly to avoid the earlier low-fi acoustic recordings prior to 1926 and secondly to avoid the less rare recordings made after 1940. Most of the recordings are indeed relatively rare – for instance, I already had only half a dozen of the 48 tracks in my collection, which is reasonably comprehensive from this period. To me, this implies that many of these recordings may not have previously been reissued on CD. All tracks are American except for six recorded in London, UK; and almost all of the American tracks were recorded in New York. Well known bandleaders include Red Nichols, Frankie Trumbauer, Eddie Condon, Fletcher Henderson, Harry Reser, Sam Lanin, Ben Pollack, Ambrose, Nat Shilkret, Ted Weems and Ben Bernie. Even some of the lesser known bands have stars such as Tommy Dorsey, Jack Teagarden, Eddie Lang and Joe Venuti in them. The AJM has ‘cleaned up’ the original 78 RPM records from its collection by removing annoying surface noise; but otherwise the tracks do not sound is if they have been extensively graphic equalised or interfered with. The resulting audio quality sounds like that from 78s in very good condition, which I think is a good audio standard to aim for. I also think that there is a good musical quality in the tracks selected. Jazz purists might prefer to classify some of the tracks as ‘hot dance’ rather than jazz, but to my ears they all have a jazz feel to them. The AJM has used Brian Rust’s discography ‘Jazz Records 1897-1942’ as a guide to both jazz classification and recording personnel. There are no insipid best forgotten commercial pop songs amongst them; and many of the so-called hot dance tracks contain some good ad lib jazz solos. In my view, the best jazz solos on this album include those by trumpeter Henry Red Allen (Sweet Sue, Yellow Dog Blues); trombonists Jack Teagarden (Makin’ Friends, Monday Morning), Miff Mole (My Blue Heaven) and Dickie Wells (Sweet Sue); clarinetist Buster Bailey (Lorna Doone Shortbread); tenor saxophonist Coleman Hawkins (Sweet Sue); bass saxophonist Adrian Rollini (No Foolin’); and tubist Joe Tarto (Hittin’ the Ceiling and Just the Same). There are a couple of 8-bar cornet solos by Bix Beiderbecke on Frankie Trumbauer’s My Sweeter than Sweet, recorded on 19 October 1929. Bix also plays quietly behind Smith Ballew’s vocal, but this recording is not amongst Bix’s best work, in my view. Joe ‘King’ Oliver solos on muted cornet in Blue Blood Blues (1929) by Blind Willie Dunn’s Gin Bottle Four, but once again, this is not Oliver’s best work. Roughly half the tracks have a vocal chorus on them, but whilst adequate, the singing is not particularly memorable. Unlike many of the instrumental solos, the vocals sound more ‘dance band’ than jazz. A couple of exceptions are Jenny’s Ball (1931) sung in a classic jazz style by Mamie Smith, and Wipe ‘em Off (1929) sung by Clarence Williams. Interestingly, Clarence also plays jug on the latter track where the pianist is Willie ‘The Lion’ Smith. One track of historical interest is Skeleton Jangle recorded in 1936 by a reunion of the 1917 Original Dixieland Jazz Band, with a different pianist. Whether by accident or design, the 1936 band sounds remarkably similar to the 1917 band, but with better audio quality. The current online price for this 2-CD album is $25 plus packing and postage, which is very good value in my opinion. Disclosure: Tim Harding is a life member and former board member of the AJM when it was the Victorian Jazz Archive. Vol. 47 No. 1, Autumn/Winter 2014). 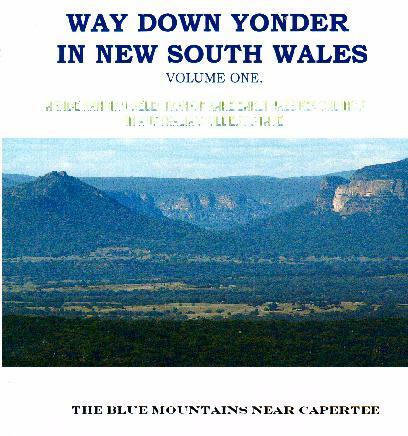 Album: ‘Way Down Yonder in New South Wales Volume 2* – A wide ranging selection of rare early jazz recordings in Australia’s oldest state’ (FJM-039). The Jack Mitchell Library, Lithgow. This compilation CD has been put together by the Australian jazz collector and discographer, Jack Mitchell. It is an interesting cross-section of early Australian jazz and hot dance music, recorded in Sydney between the years 1926 and 1961, but mainly in the 1940s and 50s. The bands range in size from the traditional 6 or 7 piece groups led by Ray Price to the larger swing band format of Jim Davidson and his Orchestra. The first thing a listener can’t help noticing is the low-fi audio on most (but not all) of the tracks on this album. Ironically, at least 6 of the tracks were recorded live on tape by the late Robert Parker. It doesn’t sound as if any of the original recordings have been remastered; and this detracts from the listening experience in some cases. Nevertheless, most of the tracks are likely to be of interest to jazz historians and collectors. The obvious next question is whether the music is good enough to justify a future effort of audio restoration, which can be a difficult and painstaking exercise, as remasterers tell me. My answer would be ‘yes’; although some tracks are musically more worthy than others. The star of the album is undoubtedly the youthful Bob Barnard on cornet. When he recorded the Louis Armstrong flag wavers Cornet Chop Suey and Ole Miss Rag** with the Paramount Jazz Band at the Sydney Jazz Club in 1957, he would have been only 24 years old. It must have been thrilling in those days for jazz aficionados to hear some of Louis’ hottest early solos played live. Bob also plays on six tracks with the Ray Price Trio and friends – these are Chicago, 2.19 Blues, Stardust, My Honey’s Lovin’ Arms, If I Could Be With You and Someday You’ll Be Sorry. The other stand-out soloist, in my view, is Bob Cruickshanks on alto sax. Bob also plays clarinet on the album, but his alto solos with Ray Price on Chicago and Someday You’ll Be Sorry are beautifully melodic. Norm Wyatt places a lyrical trombone solo on If I Could Be With You, indicating some Jack Teagarden influences. The two opening tracks on the album were acoustically recorded in 1926 by The Palais Royal Californians, who apparently were the first professional American jazz band to visit Australia. That Certain Party sounds datedly ‘ricky-tick’, and probably would not qualify as jazz without the ad lib solos by Australians Frank Coughlan on trombone and Ern Pettifer on baritone sax. The Paul Mares/Ferd Morton composition Milenberg Joys is played about twice as fast as the New Orleans Rhythm Kings version of 1923 and comes complete with barnyard novelty noises. Jim Davidson’s Eventide – A Mood is vaguely reminiscent of Duke Ellington’s Mood Indigo, even down to the brief Duke-like piano interlude. It was recorded in November 1933 alongside Davidson’s far better known (and better sound quality) Original Dixieland One Step, which is also on the album. There is a swinging 27-second excerpt from a film short by a wartime army bigband called the Waratahs. The track is titled ‘One O’Clock Jump’, but it sounds to me like Bugle Call Rag. Then a mainstream quartet featuring Merv Acheson on tenor sax plays Study on the Jump Notes apparently recorded for a 1943 radio broadcast. Lester Young and Count Basie have been obvious influences here. The Port Jackson Jazz Band recording of I’m Nobody’s Sweetheart Now in 1947 features Ken Flannery on cornet instead of Bob Barnard. Bob Cruickshanks plays a decent solo on clarinet but I do prefer his alto playing. Ken Flannery later appears on trumpet in two tracks recorded by the Les Welch Orchestra. These are West End Blues recorded in 1951 and Back Back Baby of 1956, which includes a vocal by Les Welch and a clarinet solo by Don Burrows. (Les Welch was the founder of Festival Records, and claims to have pressed the first 78 rpm shellac disc and the first 33 rpm long-playing record in Australia). Don Burrows and Errol Buddle (tenor sax) play some nice solos on the final track The Craven A Theme by Bob Gibson’s Dixie Group, which also includes George Golla on guitar. Apart from the solos, this track is not particularly memorable. In its current form, this album is primarily one for jazz historians and collectors. However, after some decent audio restoration and remastering, it could also be an album enjoyed by the general jazz listener. *The album front cover says ‘Volume One’; whereas the back cover, the spine and the disc itself are labelled as Volume 2. ** W.C. Handy’s Ole Miss Rag is listed as ‘Blues (Rent Party?? )’ in the cover notes.